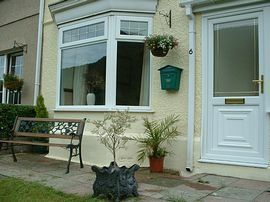 Afan Forest Breaks offers self-catering accommodation in a 3-bedroom semi detached house, situated on the main road through Afan Forest, 1 minute ride from the park entrance. Looking for the best off road cycling in the UK? Aran Forest is undisputedly the best cycling the UK has to offer. Accommodation includes a comfortable living room with a double sofa bed and views of the forest. The fully fitted kitchen includes microwave and fridge freezer and is amply big enough to cater for 8 people. The bathroom includes a spa bath and a separate power shower. There are 3 twin bedrooms. A large decking area at the rear is ideal for enjoying an evening BBQ' and useful for cleaning and maintaining bikes. Pressure washer and secure bike storage! One minute ride from the AfanFforest park entrance. Coming West, leave the M4 at junction 40. Take 3rd exit off, signposted 'cymmer / bryn'. A few yards later, take the 1st exit from mini roundabout onto A4107, signposted ' afan forest park. aprox 7 miles, pass the main entrance to 'Afan Argoed Park' on your right. Full week: Monday to Sunday £560.00 = £10.00 per person per night. 4 Nights: Monday to Thursday £384.00 = £12.00 per person per night. 3 Nights: Friday to Sunday £312.00 = £13.00 per person per night. Arrival is at or after 2.00pm. Departure is at or before 10.00am. "Thanks again a great house, great location and great bike riding! We will I am sure contact you again to stay." James.